So this weekend I replaced a tie-rod end and the torque-spec for the castle nut was 67ft-lb. 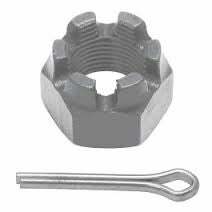 I torqued it down and the top of the castle nut was below the keeper pin hole. I’ve never had this happen before. Should I be trying to find a taller castle nut or a new pitman arm? Possibly wrong tie rod end? Surely I shouldn’t loosen it just so the cotter pin lines up.... I mean logically that makes no sense.